This brief post will provide commentary on the New York Times article U.S. Sees Risks in Assisting a Compromised Iraqi Force by Eric Schmitt and Michael R. Gordon. Selected highlights of NYT article provided below in italicized blockquotes. NYT article can be read in full HERE. A classified military assessment of Iraq’s security forces concludes that many units are so deeply infiltrated by either Sunni extremist informants or Shiite personnel backed by Iran that any Americans assigned to advise Baghdad’s forces could face risks to their safety, according to United States officials. COMMENTARY: As Cultural Advisor at the US Army War College Adam L. Silverman points out at COL Lang’s blog, Iranian-supported Shia militias such as Badr Brigade thoroughly infiltrated ISF all the while ISF was being trained, equipped and militarily supported in the field by the United States military. In this writer’s opinion the change is not so much attributable to conditions of current infiltration in Iraq, as it is an acquired sense of risk aversion brought on by recent U.S. military experiences in Iraq and Afghanistan. 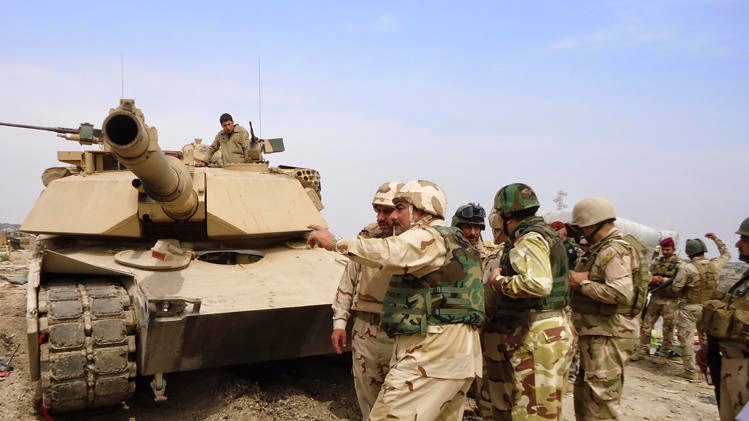 The report concludes that only about half of Iraq’s operational units are capable enough for American commandos to advise them if the White House decides to help roll back the advances made by Sunni militants in northern and western Iraq over the past month. COMMENTARY: What the Baghdad government has sought is the employment of United States tactical airpower. What’s left of Iraq’s military might still represent a sufficient force for sustained counteroffensive operations were it supported by embedded American JTACs and the brunt of in-theater, U.S. tactical airpower. Adding to the administration’s dilemma is the assessment’s conclusion that Iraqi forces loyal to Prime Minister Nuri Kamal al-Maliki are now heavily dependent on Shiite militias — many of which were trained in Iran — as well as on advisers from Iran’s paramilitary Quds Force. COMMENTARY: This is not as novel a circumstance as might be thought. Preceding OEF, the primary support rendered to Afghanistan’s United Front (Northern Alliance) came from Iran. In fact, Iran assisted the United States with UF during the run-up and initial phase of OEF. Shiite militias fought American troops after the United States invaded Iraq and might again present a danger to American advisers. But without an American-led effort to rebuild Iraq’s security forces, there may be no hope of reducing the Iraqi government’s dependence on those Iranian-backed militias, officials caution. COMMENTARY: This conundrum is something of a play on what has already transpired in Syria. The American foreign policy goal of regime change in Syria during that country’s current war against armed groups indirectly contributed not only to Syria’s greater reliance on Iran but also the rise of ISIL itself. Where attrition has largely depleted the SyAA, lack of previously rendered American tactical airpower--which assisted IA against militias during the second half of the 00’s-- is contributing toward situations of tactical failure such as these (click HERE). Moreover, continued IA failure may at some point give rise to the need where the extent of Iran’s direction of the war in Syria is likewise required in Iraq, in support of the Baghdad government and Iraqi military control of terrain. While sending American advisers to Iraq would expose them to risks and could embroil them again in conflict, waiting to act may also limit the administration’s ability to counter ISIS and encourage the formation of a more inclusive government in Baghdad. COMMENTARY: This writer would suggest that potential levels of U.S. military support capable of effectively impacting the 2014 Northern Iraq Offensive represent the political leverage the United States brings to bear in having its interests adopted in the formation of the next Iraqi government. James M. Dubik, a retired Army lieutenant general who oversaw the training of the Iraqi Army in 2007 and 2008, said that Iraq’s security forces could make gains against ISIS even if only half its divisions were effective, but that an advisory effort was very important. At a Pentagon news conference on July 3, General Dempsey noted the while Iraqi security forces had stiffened and were capable of defending Baghdad, they were not capable on their own of launching a counteroffensive and reversing the ISIS gains. General Dempsey has signaled, however, that airstrikes are still an option. In an interview with National Public Radio on June 27, General Dempsey ticked off three potential aims: targeting “high-value individuals who are the leadership” of ISIS; protecting critical infrastructure, like dams; and “blunting attacks by massed” ISIS forces — a possible assault on Baghdad, for instance. COMMENTARY: Understandably, U.S. military policy would much rather support ISF units in a counteroffensive, rather than sectarian militias. There is a time factor involved as ISF is seen as rapidly disintegrating, while burdened with the disadvantages of counterattacking an enemy along numerous axes of attack, and with it related challenges inherent with control of terrain. This writer would suggest U.S. military include among highest recommendations the deployment of JTACs embedded among ISF forward units, to be employed in a tactical airwar campaign in support of Iraqi armed forces. Successful historical examples can be drawn from the initial U.S. airwar of OEF, which from the perspective of United Front considered it essential support in their counteroffensive against Taliban and Al-Qaeda forces, as well as the U.S. airwar essential in supporting ARVN's successful rollback of the Easter Offensive during the latter Vietnam war. It should further be noted the current Baghdad government has formally and urgently requested this form of U.S. military assistance. Additionally, U.S. logistical and technical support is required in sustaining an ISF counteroffensive. Last but not least, in parallel to potential U.S. military force assistance rendered to Iraq, the Islamic State's relative safe haven in Syria requires sufficient targeting by U.S. tactical airpower, with SyAA and its allied fighting forces arguably forming the most reliable ground force component presently available.